Have you ever tried writing your name in cursive with your non-dominant hand? Humour me and have a go…it’s strange, isn’t it? Even the mere grip of the pen in your hand feels unnatural. It probably took much longer and extracted more brainpower than it usually would to write a sentence, or even a paragraph, with your dominant hand. To boot, the letters definitely do not look as good as your normal handwriting. However, you give yourself a pat on the back for the effort involved, knowing you have given it your best shot. Now, imagine someone telling you to erase it all and do it over again, until it looks as good as your normal handwriting. Then, imagine having to do that with the added pressure of a time constraint, bored peers rushing you to finish and a teacher, anxious to start the next task, breathing down your neck. This is what it is like to spend a day in the life of a child with Dyspraxia/DCD. 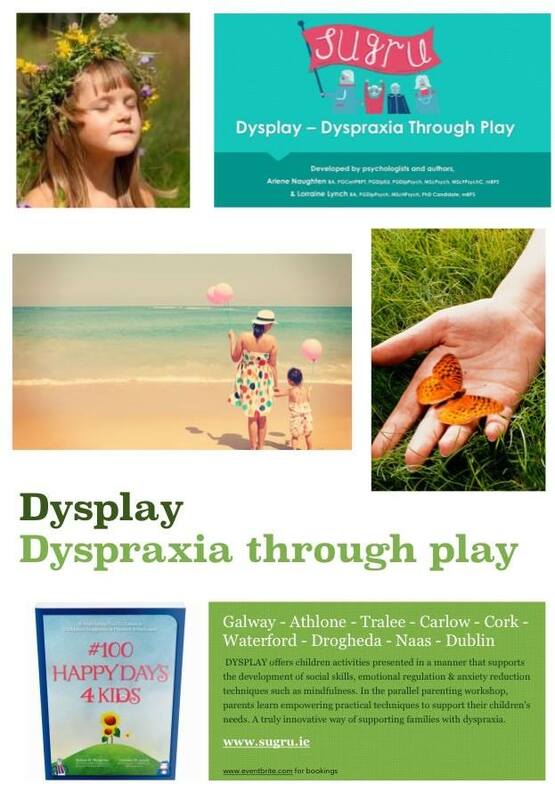 At Sunday’s Dysplay workshop, Lorraine Lynch, Executive Director and Health Psychologist at Sugru, encouraged parents and participants to embody the feeling of living with dyspraxia. Through a series specifically designed activities, we were able to experience a sliver of the sheer frustration, extra physical exertion and feelings of stress and anxiety that children with Dyspraxia/DCD experience at school everyday. To explain the feeling in a nutshell would be to imagine spending everyday having to go against every natural instinct in order to accomplish tasks within a prescribed set of rules that you did not choose while coming up short most of the time. The experience was eye-opening for many of the parents, and shed some light on the struggles children with Dyspraxia/DCD face by attempting to do simple tasks such as writing or cutting. Parents were also able to voice their concerns about their children’s experiences from their own perspective. Issues of lack of self-esteem, difficulty making friends, bullying and anxiety at school seemed to ring true for all involved. However, the most common theme was that teachers, in general, do not understand or know enough about this neurodevelopmental disorder. One parent even said the teacher “doesn’t believe” in Dyspraxia/DCD, as if it were some ancient myth children used to excuse their shortcomings in the classroom. As parents expressed their own anxiety and heartbreak over their child’s daily struggles, the plight of the parent became clear: they are battling against a lack of resources and empathy in schools, sporting clubs, and many other institutions. As well as this, getting their child to engage in sports activities and homework in the evenings, helping them to regulate their emotions while dealing with other siblings, and household chores, are some of the challenges they face on a daily basis. Giving parents the opportunity to share their thoughts and concerns with each other was an important part of the workshop. In this way, Dysplay also acted as a platform for parent-to-parent support. As of yet, there are not many support groups for parents or caregivers of children with neurodevelopmental conditions like Dyspraxia/DCD. Sugru is in the process of establishing this type of forum for parents through workshops, social clubs and online forums to help them cope with everyday obstacles. Through gaining a better understanding of the child’s perspective as well as learning more about the research done in the area of DCD, specifically in Ireland, parents walked away with a greater deal of knowledge about their child’s disorder. A key piece of advice for parents to take away was to find teachers and coaches who were supportive, encouraging and positive in order to encourage children to participate in social and sporting activities. Having these kinds of caregivers around your child will increase their self-esteem and self-efficacy as well as lower their anxiety of failure. As part of the workshop, Arlene Naughten, counselling psychologist at Sugru, also offered tailored advice and strategies for individual families.